If you need somewhere to leave your pet while you are busy at work or have errands to run or will be away for a while, you will feel secure and relaxed knowing it is being cared for at Glamour Paws of Fort Myers Doggy Daycare. 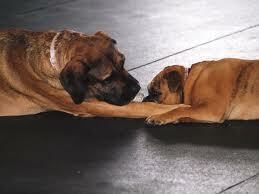 Your best friend will be integrated into one of our supervised play groups that best suits him or her. This is done carefully and at a pace within each dog’s comfort level. Whether a shy flower, a social butterfly, or a ball playing jock/jockette, the pup will be comfortable and have a great time at Glamour Paws. Our supervisors are trained to comfort those pets who have separation anxiety or difficulty around other animals. They pride themselves on properly acclimating your dog to the new surroundings and to teach it to ‘play nice” with its peers. In some cases rather than group play, some dogs prefer general exercise on our oversized dog-runs and mental stimulation of individual play during their stay, which we happily provide. This can result in a happier more fit pet. We also offer special care for puppies (3 to 6 months old) which includes socialization with other puppies, desensitization, basic obedience commands, and lots of love and attention. And for your mature pet, we work to keep them as comfortable as possible including mobility assistance or special handling for the visually impaired. We welcome calls from you to check in on your dog at any time. We will let you know how he or she is doing. Glamour Paws offers pre-paid packages for full day (over 6 hours). If you purchase a package of 20 days or more you get $5 off per day! 20 full days of day care for only $340. As an added benefit, your loved one will receive one free bath during that time.